MANILA, Philippines, April 16, 2011 (ENS) – Twenty bright yellow electric tricycles take to the streets of Mandaluyong City in Metro Manila this week, marking a first step towards a sustainable, energy-efficient transport model for the Philippines. The 20 e-trikes are part of a project to introduce clean transportation alternatives in the Philippines funded by a $110,000 grant from the Asian Development Bank. A beaming President Benigno C. Aquino III attended the ceremony Wednesday at the Mandaluyong City Hall handing over the new e-trikes to the Tricycle Operators and Drivers Association. “There are currently 3.5 million motorcycles and tricycles in the country that emit close to 10 million tons of harmful gases and use more than $200 billion worth of oil each year,” President Aquino said. “The only way we can insulate ourselves from external shock such as high oil prices is to implement long-term solutions that ensure energy sufficiency and sustainability for us and for future generation of Filipinos. The solution is in the e-tricycle project,” he said. Mayor Benjamin Abalos and the Philippine Energy Efficiency Project of the Department of Energy have collaborated to make Mandaluyong the first city to have e-trikes. As part of the pilot project, the Asian Development Bank will install four charging stations in Mandaluyong City, which will be able to charge the e-trike batteries to 50 percent capacity in less than 30 minutes. One of the charging stations will use solar energy. Emissions from the transport sector amount to 30 percent of all air pollution in the Philippines, and roughly 80 percent of air pollution in Metro Manila. Public transport vehicles, particularly from tricycles, jeepneys and buses, a responsible for a large part of these emissions. Motorized tricycles, which are motorcycles with sidecars, are popularly used as low-cost public transport for short distances. The country is poised for a clean transportation revolution and greater energy independence. “The Philippines is assuming a leading role in Asia in supporting green transportation alternatives, and if e-trikes are followed by new fleets of electric buses and jeepneys, the effect could be transformative,” said Kunio Senga, director general of the bank’s Southeast Asia Department. 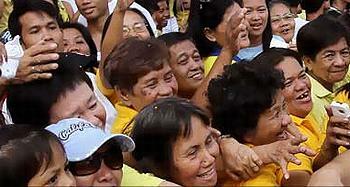 “Working together, we can give Manila cleaner air, bluer skies, and a more livable environment,” said Senga. 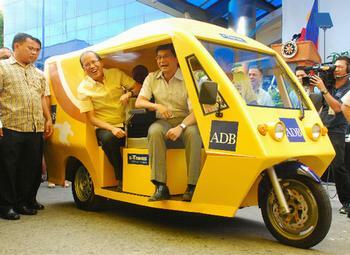 ADB is in discussions with the government and other development partners on a proposed project to scale up the rollout of energy efficient e-trikes in Manila and other urban areas in 2012. Though the new e-trikes have higher up-front costs, older petrol tricycles are more than twice as expensive to operate and maintain in the long run. The cost savings will directly increase the incomes of e-trike operators. The new e-trikes use lithium ion batteries, commonly used in laptop computers and mobile phones. The batteries can be recharged about 2,000 times, in contrast to lead acid batteries used in older e-trike models that must be replaced every two years. An ADB pilot project demonstrated that the Philippines has the local manufacturing capacity and technical skills base to build and maintain a large e-trike fleet, creating many new jobs. Bank data shows that even factoring in the electricity required for charging the batteries, the e-trikes’ carbon footprint will be less than one quarter of petroleum-fueled tricycles’ carbon dioxide emissions.